It has been a little more than a month since General Conference finished and everyone returned to their home churches. The members of your Governing Board have been busy getting to know each other, learning how to work together and do the business of the denomination on behalf of the General Conference. We continue to appreciate your ongoing support and prayers as we undertake the difficult task of appointing an Interim Moderator. We are grateful for the many queries and suggestions we continue to receive and regret we don’t have the capacity to conduct webinars or respond in detail to all suggestions individually. We have, however, listened to all suggestions. We hope this letter will answer some questions you may have, clarify some assumptions that are being made, and help you understand the way we are managing both this process and our wider responsibilities. We have tried to address all the questions we have received, some, more than once. Many of the questions or suggestions we’ve received are questions we discussed in our meetings. We continue to covenant not to conduct business via social media; thus, we may not be aware of queries and comments posted via that medium. We also commit to deal directly with all constituents of UFMCC and won’t respond via Facebook if a letter is addressed to us individually. We ask you to help us in this by encouraging people to contact us directly: [email protected]. We reaffirm our intent to conduct an open, fair, and transparent process and we will not change the criteria of application midway through the process. To do so would be unfair to those who are considering applying. from applying for the Interim Moderator position? We have been tasked by General Conference with appointing an Interim Moderator to serve a term of three years. This is distinctly different than the six-year term which was considered at Conference. It is our view that any candidate who discerns a call to this position should be eligible to apply. The job description and the application packet are designed to highlight the specific skills and abilities necessary for an Interim Moderator. It will be our responsibility to discern through prayer and careful consideration which applicant is best suited to the job. We do not want to prejudge or restrict that discernment process. We understand that, for some, the failure to elect any of the candidates presented by the Moderator Nominating Committee (MNC) to General Conference represents a clear statement from General Conference: a belief that the individuals presented were not acceptable to be Moderator. However, for others, the voting at General Conference and the events prior to General Conference were sufficiently marred by perceived, as well as real, racism, sexism, misogyny, and ageism. It is our belief that any candidate who had the courage to stand for election and yet feels called now to apply to serve in this different role should be actively encouraged to do so. We have reviewed the voting record, and while none of the candidates reached the required majority in both houses (though we acknowledge that the Lay House did elect a candidate on two ballots), it is clear that the majority of voters found the Moderator Nominating Committee had presented four candidates who were well qualified for the role of Moderator. We believe there are many ways to interpret the eventual result of the voting, and we will not engage in speculation. We believe that while the majority of voters acted in good faith and voted according to their consciences, there are systemic issues surrounding diversity, inclusion, empowerment, respect, privilege, and intersectionality which have been overlooked for some time. We believe these issues resulted in some of the behaviors during the business forum and meeting. We support the work of the Office of Emerging Ministries to investigate and tackle these issues. We know this work will take time, it will be hard and uncomfortable, yet it must be done. Why have we not dictated the eligibility of an Interim to apply in 2019? As your Governing Board we have debated the eligibility of an Interim to apply in 2019 and acknowledge there are merits to both positions. We understand in a local church environment, Interims are often prohibited from continuing, however, we highlight there is a difference between local church polity and the denominational bylaws. In a local church, a pastor is elected by the congregation for a permanent role, and while it is expected that pastors will move to another role after a period of time, there is no end date to their employment. The Moderator has a six-year term. There is no expectation of automatic renewal. We are conscious of the fact that an incumbent may be perceived to have an advantage in this application process. We believe, however, it is part of our challenge over the next three years to look at the institutional biases and assumptions which would limit the opportunity for both current and future leaders. The 2016 General Conference was the first time the denomination held an open election for Moderator with multiple well known candidates. We are still learning. We are clear this is not the first three years of a nine-year term and we don’t want to second-guess the individuals who may apply or who may be called in the future. We do not want to limit what God may do in the next three years if we leave the possibilities open. We trust the next MNC and General Conference in 2019 will discern the best candidate at that time. Who have we invited to apply? We sent the invitation to apply to over 11,000 email addresses from MCC’s mailing lists and invited everyone to forward the application to their preferred candidates. 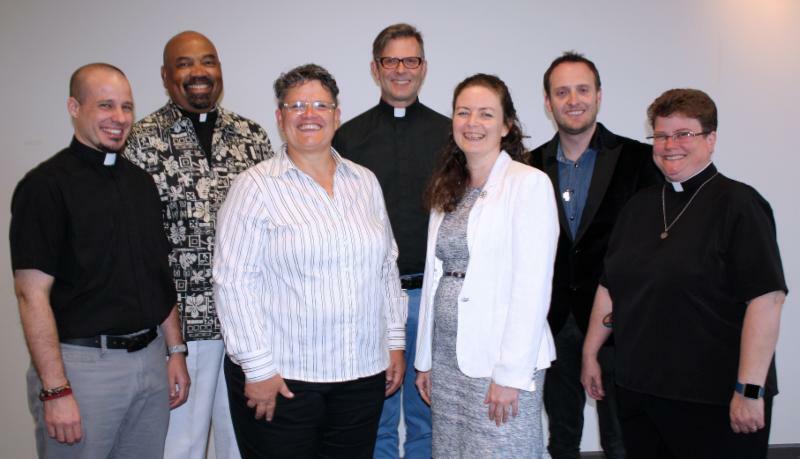 We sent the job notification and application packet to our partner divinity schools, other denominational partners such as The Fellowship of Affirming Ministries (TFAM), United Church of Christ (UCC), and Disciples of Christ (DOC), The Interim Ministry Network, and the social justice groups we work alongside. We wanted to empower anyone who wished to consider applying to be able to do so, and therefore circulated the application as widely as possible. Who have we consulted in preparing the application packet? We sought to keep the list of consulted people small to ensure anyone who wished to prayerfully consider to apply could do so in the privacy of their conscience and family without having to declare a potential interest prematurely. We utilized the extensive work of the MNC. We did not consult directly with the MNC so as to allow the individuals on that team to recover from their General Conference experience, nor did we consult with the Senior Leadership Team, Council of Elders, staff, or any of the candidates presented at General Conference. What will the role of Interim Moderator be in relation to appointing Elders? We acknowledge that the normal duties of a Moderator would be to appoint and remove Elders. We, in consultation with Rev. Dr. Nancy Wilson, decided this would be inappropriate for an Interim Moderator. The current Council of Elders will remain unchanged until 2020 when their terms expire and will have responsibility for maintaining their own discipline. In the event that an Elder needs to be removed, the Council will manage that process internally. What will be published as the process progresses? We understand that as the appointment process progresses, people may be curious about who has applied for the position. This is a recruitment process and anyone who has the courage to apply has the right to privacy in respect of their application. With this in mind, we will not publish status updates or candidate information. We ask you to respect this decision. Why will the process take so long? And why will it not take longer? We are a global denomination, and as a Governing Board, we recognize that finding the best candidate for this job is more than challenging. We expect applicants to take sufficient time considering their application and believe we should honor this by taking sufficient time to fully review every application. We believe this process may require multiple interviews to identify the best candidate. We are aware that what is considered normal for recruitment processes differs greatly around the world and specifically notice periods outside the US can be significantly longer than those typically experienced in the US. Conversely, we also know that we are at critical time in our movement and organization. Adopting a “six-month plus” timeline, then adding more time for “onboarding” and adjustment, is simply time that we do not believe we have. Selecting a new Interim Moderator is not merely a critical decision the Governing Board needs to make, but it is a decision that is necessary in order to move forward in the areas of healing and financial reform, as well as critical discussions dealing with diversity, inclusion, and the barriers of the multiple “isms” that have been clearly identified. How can you/we engage in and support this process? We ask you to please commit to praying for your Governing Board and for our Metropolitan Community Churches as we discern God’s guidance in the appointment of an Interim Moderator. Please engage in holy conversation in your congregations about the issues we face concerning racism, misogyny, sexism, and ageism, and how these appear in our local and global contexts. Please communicate your questions, concerns, praises, and hopes directly with the Governing Board at [email protected]. Thank you for your faithfulness in ministry!